Liberia and Turkey on Tuesday signed three key agreements to enhance bilateral relations. The countries agreed to work together in the areas of education, mutual visa waiver for holders of diplomatic passports and a collaboration between their diplomatic institutes. 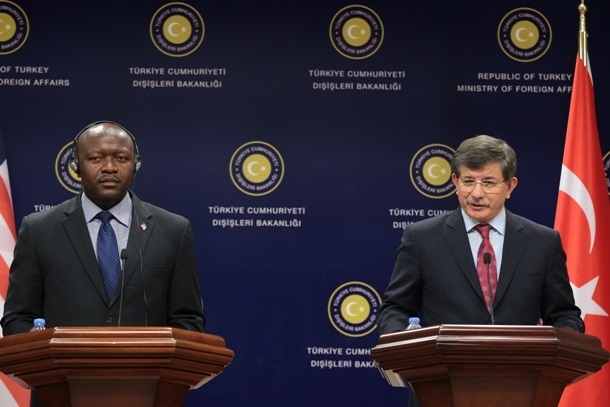 Augustine Kpehe Ngafuan and Ahmet Davutoglu, the respective foreign ministers of Liberia and Turkey signed behalf of their countries during a ceremony at the Turkish Foreign Ministry in Turkey’s capital, Ankara. In remarks, Minister Davutoglu described the signing of the agreements as a historical day for the both countries. “This is actually the first official ministerial visit on the basis of our bilateral relations, that is why the Government and People of Turkey attached all the importance to it”, he said. He said the three agreements are the first in the series of cooperation’s agreements his country intends to sign with Liberia. The Turkish Foreign Minister named the agreements as air services, trade and economic and security. “Today with my dear friend the Foreign Minister of Liberia we have discussed the future and steps to be taken in terms of the relations between our both countries and we agreed on an action plan including promotion of investment and avoidance of double taxation as well as taken action steps to make the three agreements a reality”, the Turkish foreign minister said. Minister Davutoglu, who promised to visit Liberia before the end of the year, also paid homage to Liberian President Ellen Johnson Sirleaf for her leadership role in African and World issues and is hoping the president, who is a Nobel Laureate, will one day agree to visit his country. Liberian Foreign Minister Ngafuan, in remarks, said the signing the agreements have given the bilateral relations deeper depth and wider breadth. “The Agreement on Mutual Visa Waiver is aimed at alleviating the hurdles our officials go through when traveling to our respective countries. The second is in the field of education thus leading to the exchange of information and scientific publications in the field of both formal and informal education, the exchange of experts, teachers and students, amongst others while to further enhance our diplomatic relations, a Memorandum of Understanding on cooperation between the Diplomatic Academies of both countries have been conluded”, the Liberian foreign minister noted. Minister Ngafuan revealed that Liberia is completing its review of proposed agreements on Security, Trade and Air Services. “I am confident that these Agreements will be concluded and signed very soon, paving the way for the consolidation of our partnerships, especially the beginning of flights of Turkish Airlines, your world-renowned carrier reputed for its excellent service, to Liberia”, he added. Minister Ngafuan welcomed continued Turkish private sector investment in Liberia while also commending Turkey for its support to the cities of Monrovia and Paynesville as well as support to the Liberia Water and Sewer Corporation. Speaking about the recent shooting at a café in Istanbul which left many wounded including four Liberians who were shot in the legs, Minister Ngafuan said the incident aroused sensitivities in Liberia and had the potential of diverting attention from the many good developments that have characterized the bilateral relations between Turkey and Liberia. “But thanks to Minister Davutoglu and the Turkish Government for their intervention which has ensured that the victims receive adequate medical attention and security. We anticipate that the perpetrator(s) of this heinous crime will be arrested and brought to justice,” the Minister concluded. Minister Ngafuan is in Turkey in honor of an invitation extended him in March of this year by his Turkish counterpart, Foreign Minister Davutoglu . Also on the Foreign Minister Ngafuan’s delegation to Turkey are Monrovia City Mayor Clara Doe Mvogo, and Paynesville City Mayor Cyvette Gibson.